About Deering High School Deering High School is the most diverse high school in the State of Maine and north of Boston. Our students speak over fifty home languages and come from more than thirty countries on five different continents. We are the only high school in the state to offer Mandarin, Arabic, French, and Spanish. Committed to our over one-hundred years of tradition, we are still that beautiful high school on Stevens Avenue that continues to build our community and proudly serve our city! The goal of Deering High School is that every graduate possesses the knowledge, skills, and habits of mind necessary to succeed and contribute to the 21st-century global environment. It is a goal for each and every Deering student; our mission is excellence and equity in the global era. The following is a profile of the attributes we strive to develop in each Deering graduate. 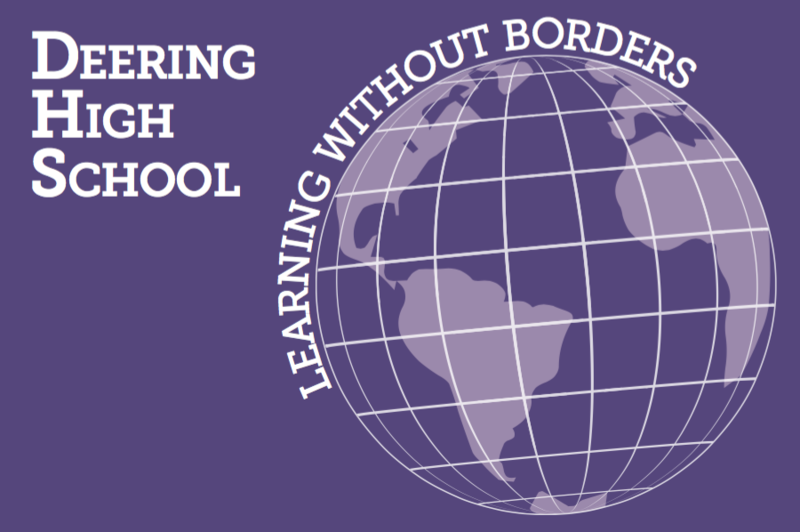 Deering High School is committed to creating a student-centered and globally-focused environment for teaching and learning, both in and out of the classroom. With over fifteen Advanced Placement courses, multiple dual college enrollment opportunities, many extracurricular clubs and activities, and abundant Expanded Learning Opportunities (ELOs) and activities to choose from, we invite every student to find their strength and their passion in order to make their unique contribution to this school community, the State of Maine, the U.S. and our global community! Welcome to the Purple Palace, Home of Ram-Nation! Get your family photos for just $50!